We've all launched a new project as a means of drawing a line under another and it seems this is exactly what Slaughterhouse has meant to Crooked I, Joell Ortiz, Royce Da 5'9" and Joe Budden. All had attracted one controversy or another in their earlier careers and each seems to have used the supergroup as a means of moving on, even addressing some of these issues on record. The foursome came together (as a five-piece) in late 2008, collaborating on Joe Budden's track Slaughterhouse, from the rapper's Halfway House LP. The fifth member, Nino Bless, must have missed a crucial memo or meeting as he was the only one who didn't go on to feature in the new supergroup. To some extent revitalised by the project, the foursome brought devastating energy to their self-titled debut album, which was released in August 2009. Selling nearly 20,000 copies in its first week, the record reached No 25 on the Billboard 200. A second album was hotly anticipated but ultimately put on hold as Slaughterhouse first signed for a major label. The follow-up record, Welcome to: Our House, is currently set for release in June 2012 and the quartet are now criss-crossing the US with the Welcome to: Our House Tour, which hits these shores in May. 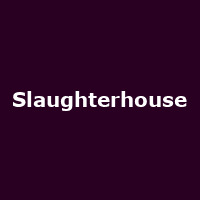 Slaughterhouse play the HMV Forum in London's Kentish Town on 15th May, followed by dates in Birmingham and at Manchester's Sound Control on the subsequent two nights. We have tickets available now, priced £20 for London, £15 for Birmingham and £18 for Manchester.